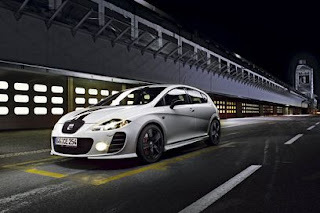 The all-new Leon… Now with superpowers from SEAT. The new Leon has a highly tuned version of the 2.0-litre TFSI engine which comes straight out of the standard Cupra, but this one pumps out 281bhp. The 0-62 is only 5.6 seconds and to top it off it has stripes over the bonnet. The handling on the Leon has been improved. Engineers have decided to upgrade the suspension and brakes on the new super model. With twin tailpipes, 18-inch alloy wheels, a body kit, bucket seats and the stripe, SEAT has created their most powerful machine yet.